Every time a client arrives for a Relash, a full assessment of the previous application should be conducted and an application plan discussed with the client. 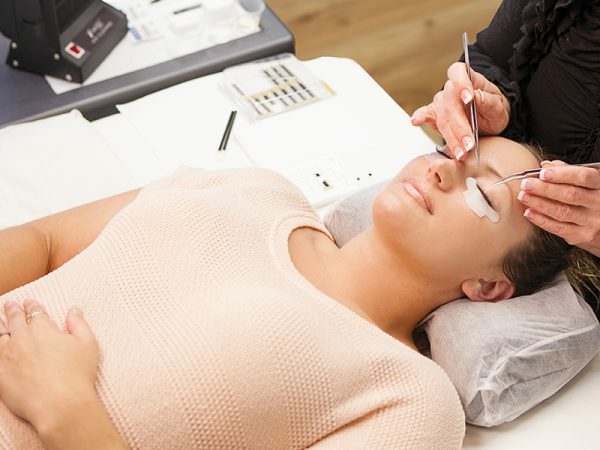 This ensures that both Lash Stylist and Client have the opportunity to make any design adjustments, go over aftercare procedures, and identify lash extensions or residual adhesive that needs to be removed prior to the Relash. Failing to remove and replace lash extensions that have grown out will create a less than desirable lash line. Today, let’s talk about the Peel Removal Technique and how to do it. The Peel Removal Technique is a fast and easy method to remove select eyelash extensions that have extended beyond the 1-2mm placement position. Before proceeding, be sure to evaluate the client’s natural eyelashes (before the cleaning process) to identify if there are any residual adhesive leftover on the natural lash that needs to be removed. You will typically see this when a lash extension disconnects from the natural lash and falls off alone and on its own. When it comes to Relashes, never take shortcuts by applying a new lash extension on top of an older, outgrown lash extension. Doing so will cause the base of the new lash extension to be placed incorrectly and gaps to form in-between the two lash extensions. Additionally, applying a new lash extension on top of old, residual adhesive can result in a bond that is not fully secure. Always apply a new lash extension on a natural lash that is clean and smooth. An application performed on a clean surface also feels weightless for the client. Discuss any design adjustments or changes requested by the client. Based on the client’s lifestyle, suggest design changes that may promote longer lasting lash extensions. Clean lashes and eyes thoroughly so you can easily see the lash extensions at its 1mm position and loose bases, if any. Peel lash extensions that have extended beyond the 2mm position off the natural lash. These are the ones you’ll be replacing. Peel off any old, residual adhesive that is visible on the natural lashes. Clean, prime, and dry the lashes. Relash and document changes performed and application information. To watch the entire Peel Removal Technique tutorial, log in to your Xtreme Lashes account and visit Education. The Peel Removal Technique tutorial can be found in the full XL Tutorial or by searching Peel Removal.